After spending the lead up days after Tizy World Cup in the south of France, a few days of hard training and a new environment to excite the trip, with a good 30 pieces of luggage between us, we set off to Hamburg. Never being to Hamburg before, I was just going off what I saw on TV or from the race last year and using my little knowledge of the German language. Right in the centre of Hamburg, 400 000 people lining the streets to cheer on first to last- the atmosphere was amazing!! I have never seen anything like it. Arriving and already getting asked to sign photos…of Erin Densham; I had to point them to the right person. Hamburg is a pretty busy place- shops, bakeries and a big lake in the middle. Walking around in tracksuit pants or to swim familiarisation in my wetsuit, I felt slightly underdressed. Tiszaujvaros invited us again for a new exciting format of racing- semi and finals racing. 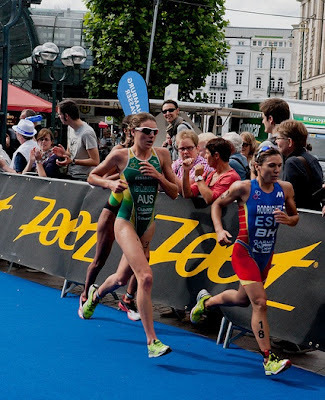 After racing similar to this last year as a junior, I was nervous to see what Tiszaujvaros could bring me this year. With 27 girls per heat and only 12 making it to the final.. you had to be on your game from the start. With the Eiffel Tower at your doorstep, the city of love awaited us for my second French Grand Prix of 2012. A short trip from home, I was excited to race Paris after the stories and videos I had watched from the race. Like always my French team, Tri Val de Gray looked after we so well, making pre race procedures easy. An early start to race day, the clear skies from my window looked promising. 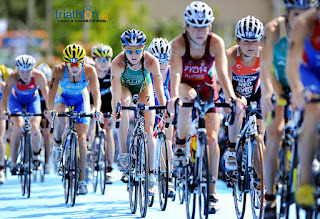 A short 5km ride to race start and a lap around the course gave me a brief idea of the corners and what was ahead of me. Before race start, the weather started to decrease and the rain started pouring from the sky. I spoke with Barbara about trying not to start behind a pole from the bridge as we would miss the current. Having not much choice in our start position, it became much to our benefit as we missed out being out in the cold from swimming out to the pontoon.